I’ll be frank with you – I think Nvidia really killed it last year. Right now I still consider the GTX 970 to be the best card on the market, balancing performance and value almost perfect while giving AMD nightmares at night. But even the smaller Maxwell card is still above the mid-range market, and Nvidia didn’t really have anything to offer in that regard last year. They aren’t, however, wasting time in 2015. Say hello to the GTX 960. The GTX 960 is the true mid-range Maxwell card Nvidia has been hiding. 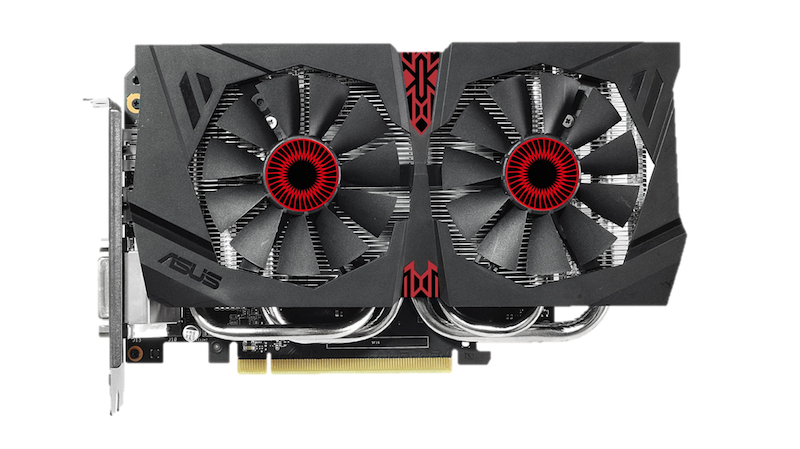 The ASUS Strix variant we were sent for review bears a striking resemblance to last year’s Strix GTX 970 and 980, falling under the same range that is leading ASUS graphics cards currently. That means the GTX 960 comes with everything the Strix range has to offer, including their brilliant DirectCU II cooling solution that only starts spinning fans when temperatures exceed 55 degrees Celsius. The card is absolutely silent when not pushed, and even under load it’s whisper quiet and incredibly cool. ASUS has also, unsurprisingly, bumped up the cards from the stock GTX 960 (which we sadly didn’t have for comparison). Here we have a 1291 MHz core clock speed, complemented by a 1317 MHz boost clock and 7200MHz memory speed. All of these are higher than the stock cards, delivering greater performance in most cases. But with a mid-range cards come a little bit of trimming. The GTX 960 only offers 2GB of GDDR5 memory, and only on a narrow 128-bit wide memory bus. That’s perfectly fine for most games at 1080p (although some more recent games already demand more), but anything higher starts to present problems. 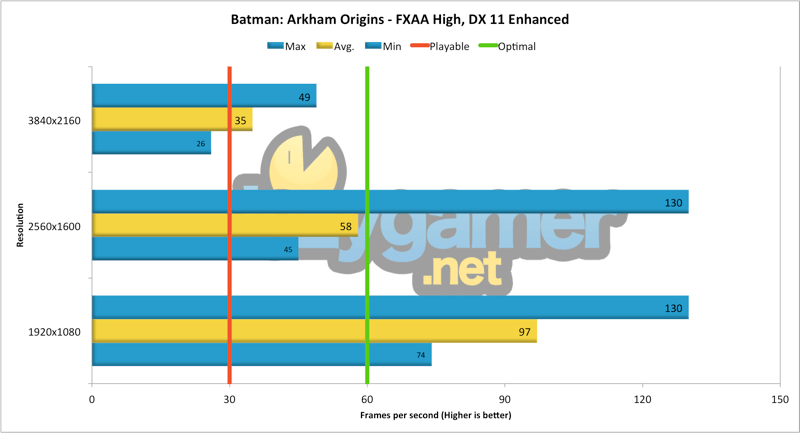 Higher resolutions mean more memory, and 2GB with most titles is already pushing at at standard HD. Nevermind the narrow memory bus, which virtually guarantees the GTX 960 as a mid-range card, and not much else. Still, with the reasonably high clock speeds, the GTX 960 is still a force to be reckoned with, as seen in testing later on. The card itself is smaller than the GTX 970, but only in length. Thickness wise they’re about the same, but you probably won’t struggle fitting the 960 into any existing case you might have. You also won’t need to start looking at new power supplies, as the GTX 960 retains the best trait of its bigger Maxwell brothers. With a TDP of just 120W, the GTX 960 is super efficient, and the added DirectCU II wasn’t enough to shake ASUS off the single 6-pin power requirement. The card also features various output options, with a single HDMI port, three DisplayPorts and one DVI output. As always we slapped the Strix GTX 960 into the trusty Evetech Lagzatron 3000 and loaded up the same four titles we used to test out the GTX 970. We’ll be giving the titles a little brush up soon to add in more modern games, but for now it’s interesting to see how the mid-range card stacks up against its undeniable meatier brother over the same tests. 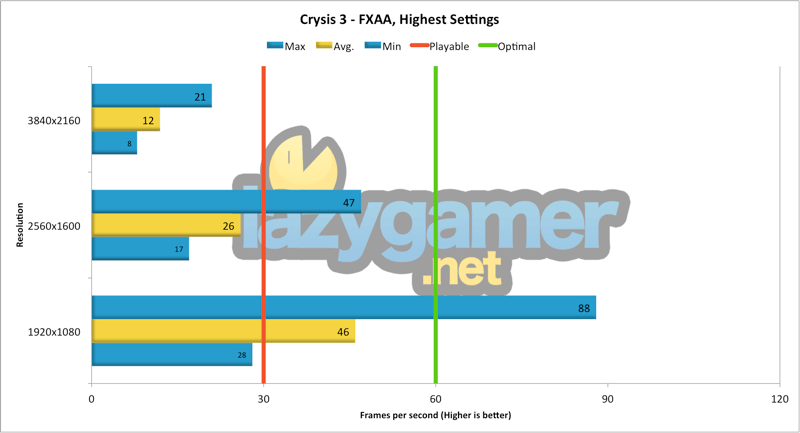 Crysis 3 is, and will still be for a long time, one of the most demanding experiences on PC. It doesn’t make that much sense, but the CryEngine-powered title still brings PCs to their knees. The GTX 960, all things considered, did reasonably well. There’s not enough for a solid 60 FPS at 1080p, but it’s still well above playable levels. The same can be said for 2K (just barely), although as expected 4K is well out of the question. Batman: Arkham Origins is the least stressful test we have at the moment, and probably the first one to go very soon. Still, it’s useful to see performance on the Unreal Engine, which powers most games nowadays. In this regard, the GTX 960 blows it away, managing to surpass a stable 60FPS at 1080p, and just dip below at 2K. It even manages to stay above 30FPS at 4K, which is astounding for a card with so little memory. 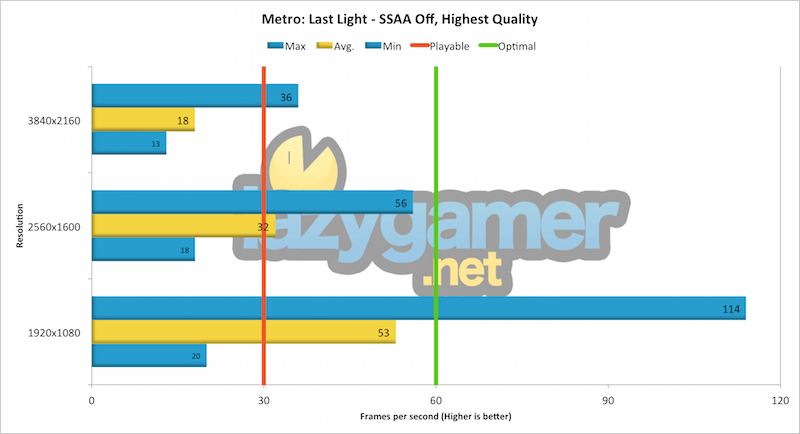 Metro: Last Light’s benchmark feature is still one of the toughest tests to pass, especially when you start cranking up the resolution. The amount of on-screen activity is immense, but the GTX 960 managed to keep cool under the 1080p pressure and push out close to a locked 60FPS. It even manages over 30FPS on 2K, although 4K is yet again an unattainable dream. 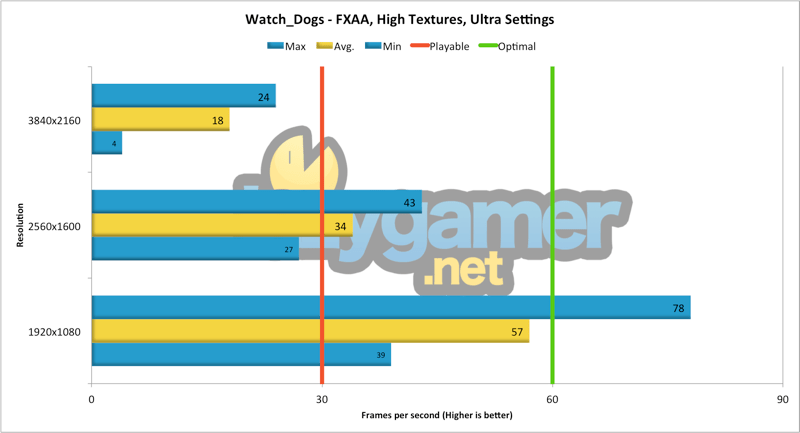 Believe it or not, but Watch_Dogs is still not entirely stable on PC. That’s horrible for players, but it makes a fine proving ground for testing cards. Going on a massive, scripted shooting (and grenade flinging) spree tested the GTX 960, which delivered just under 60FPS at 1080p. The same pattern emerged for higher resolutions, with 2K being playable but 4K being far to difficult a task to run smoothly. Futuremark’s 3DMark software also stands the universal benchmark for most hardware around the globe, so we put the GTX 960 through the standard Fire test as well as Fire Extreme. It came out the other end with a score of 6726 for the standard Fire run, and 3421 on Fire Extreme. 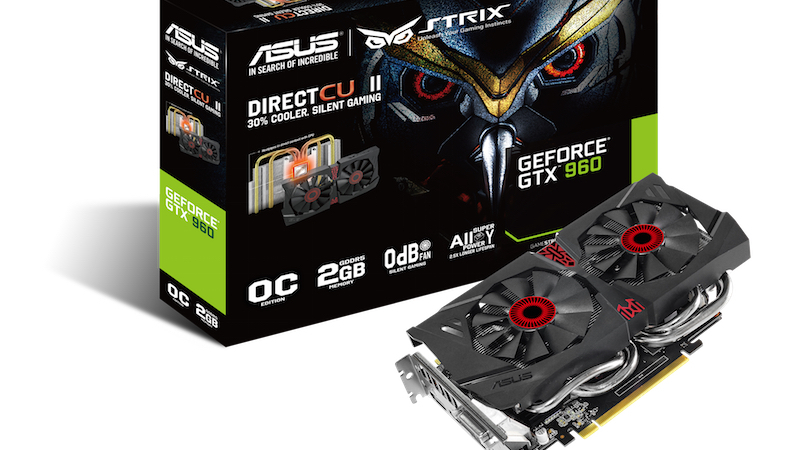 As mid-range cards go, The Strix GTX 960 performed more or less as expected. Running games at 4K is a chore for even the most powerful single cards, so expecting the 960 to manage that would be rather outlandish. Although with the 2GB memory limitation, one would expect anything higher than 1080p to be an issue, but the opposite is true. The GTX 960 is still fully capable of running games at 2K, although you’ll be limited to console-like frame rates for the most part. When it comes to standard HD though, the 960 is a winner where it really counts. The mid-range market is all about 60FPS gaming at 1080p, and the GTX 960 delivers of this front nearly every time. More importantly, it does so while staying under 65 degrees Celsius at stock clock speeds, meaning there’s even more waiting in the tank for overclockers out there. That could tables a few of the frame rates, and even allow for a few more complex setting to get a chance to shine. Regardless, this is the true upgrade to Nvidia’s GTX 660 – but at what cost? Nvidia blew everyone away with the pricing for the GTX 970 in particular (although it’s still a little steep locally), so they’d have a tough time placing the GTX 960 without undercutting themselves. The Strix GTX 960 in question will cost R3999.00 locally, while Nvidia prices suggest that reference cards will go for around a grand less. That gives you a GTX 960 for around R2000.00 less than a GTX 970, which is a marginal gap between the two. It also places the GTX 960 smack bang in the middle of the R9 280 and R9 280X in terms of pricing, making it even more of a feature filled decision. 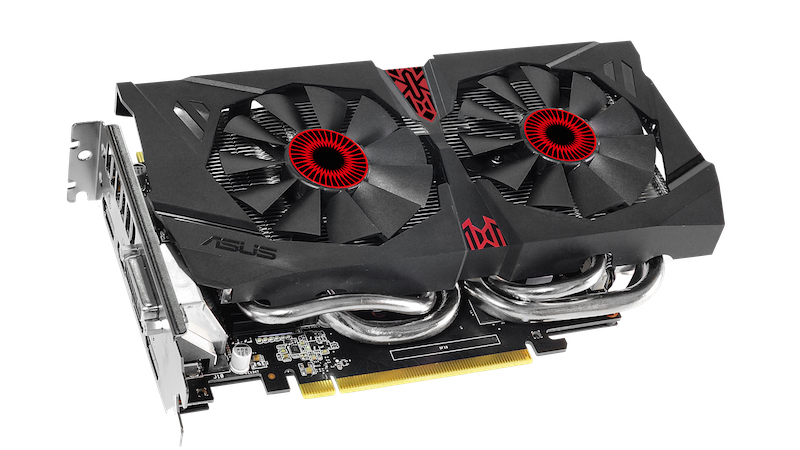 At nearly half the price of a GTX 970, you’re getting a bucket full of performance from this mid-range card. Looking over at frame rates in 1080p, the GTX 960 lagged behind its bigger brother by an average of 20 frames per second, but this gap is cut in half when you double the resolution. Running two in SLI would definitely surpass the GTX 970 in terms of speed (for around the same price), but in that scenario the 970’s 4GB of memory is a far wiser option. The GTX 960 isn’t trying to cut anyone else out of the competition – it’s just delivering fantastic performance at a lower cost. And since it’s running Maxwell, the GTX 960 comes ready and waiting to support Nvidia’s host of new features announced last year, including MFAA, DSR, G-Sync, Global Illumination and DirectX 12 support (which is even more important after yesterday’s Windows 10 press conference). It’s a sector where Nvidia has an undeniable edge over AMD, which factors in for the price gap between the two. This means the GTX 960 isn’t the same kind of stake through AMD’s heart that the GTX 970 was, but rather the best way to jump on-board the Maxwell train and enjoy high to mid-range gaming for the next couple of years. If you’ve been itching to upgrade but found the GTX 970 to be a little too pricy, then the 960 is the perfect Nvidia choice for you. 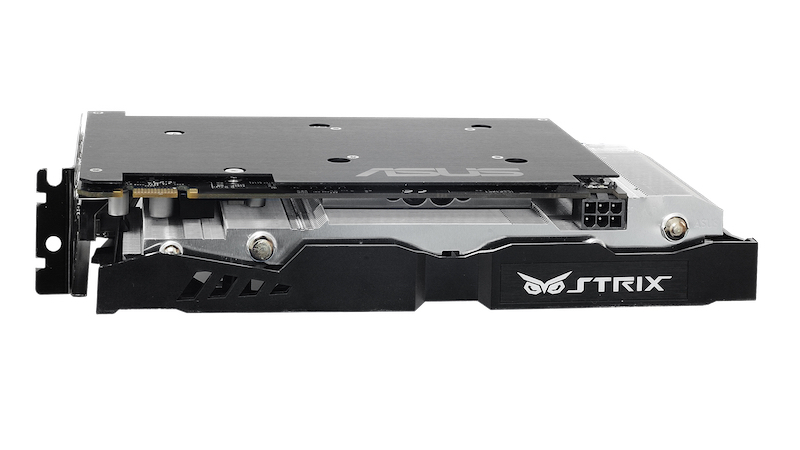 That said, you’d be hard pressed to find one better than ASUS’ Strix model. The GTX 960 is the mid-range Maxwell Nvidia fans have been waiting for, delivering great performance at 1080p despite a restrictive amount of memory. The ASUS Strix model is also the coolest and quietest design around, with a small overlook to boost performance straight out of the box.